Hearts in the Hall! 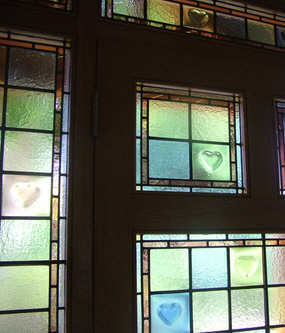 Leaded Lights in Peaslake, Surrey. The client brief for this set of windows was that they should include hearts. 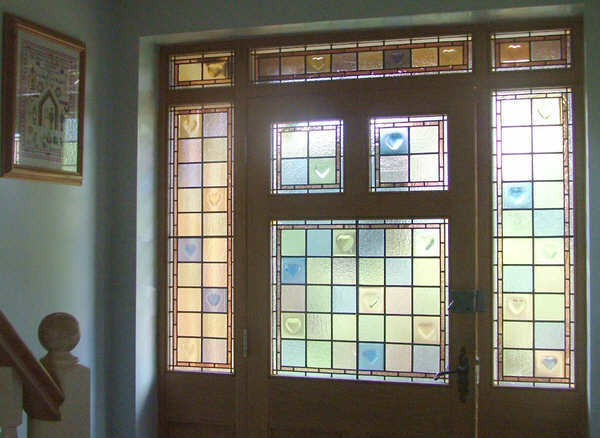 The full set of 8 windows was made using rolled cathedral glass with the addition of fused glass pieces in matching colours. I used a mixture of pale tints, blue, green, pink and champagne with a lovely border of a different style of glass in soft dusky pink. 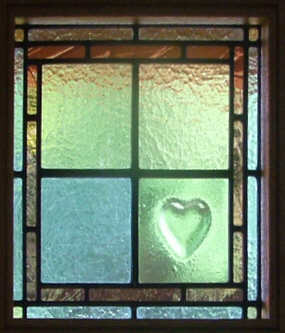 I first made the hearts by fusing the glass together in the kiln and then cutting the pieces to fit. Given a light fuse they still retain a 3 dimensional quality which means that as one moves they also appear and disappear. A really lovely delicate solution and still gives lots of light into the hall.